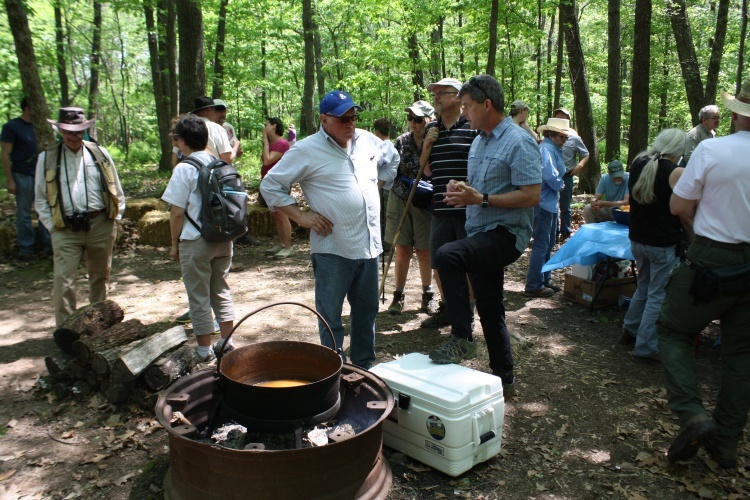 The program was put on by the Heartland Earthworks Conservancy, with involvement with the Perry County Historical and Cultural Arts Society. We even got free food! When it comes to Indian mounds in Ohio, I usually write about the Newark Earthworks. But there are others sorts: there are burial mounds, there are effigy mounds (like Serpent Mound and the Alligator Mound), but there are also hilltop enclosures, of which the best known example is probably Fort Ancient. These hilltop enclosures were called “forts” by the early settlers, but they almost certainly were not really used as forts. As far as I know there is no evidence of battles fought there. Instead, they seemed to be special places that were, in some sense, marked off with mounded earth. Except, at Glenford Fort (see, again the settlers called it a fort), it was marked off with rocks. Glenford Fort is just a bit east of Buckeye Lake, and is about 10 miles southeast of the Newark Earthworks. 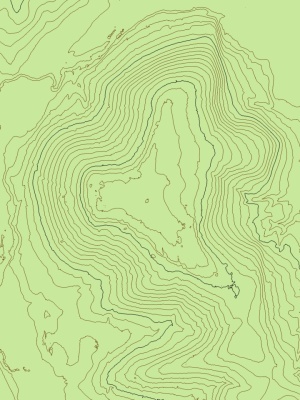 If you look at a topographic map of the Glenford Fort hilltop, there doesn’t seem to be anything special going on. 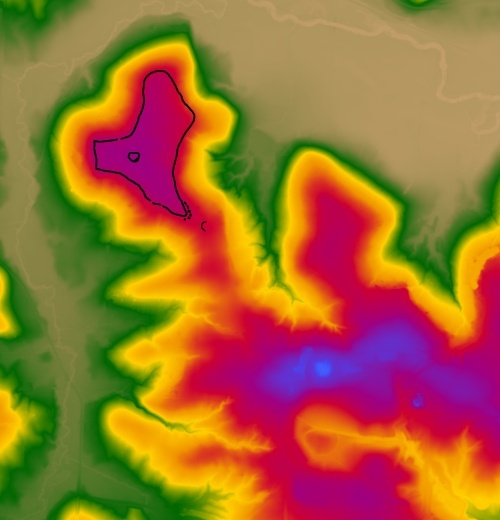 It just looks like a hilltop. But its location is pretty typical of the sort of place that the Native Americans built these structures on: the end of a ridge of hills overlooking water. In this case, the water is Jonathan Creek. 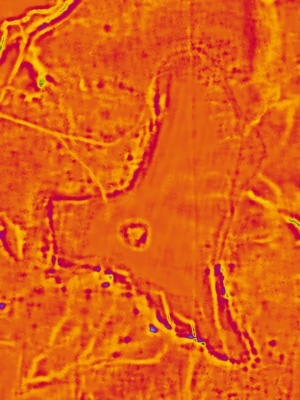 You can see that, and the enclosure itself, on this LiDAR picture I put together. If you use a program that looks for bumps (like walls) and holes (like trenches), things really stand out. Here’s a false-color image that does so. It’s pretty obvious where the walls are. It’s also quite a large enclosure. Here’s a panoramic shot taken from near the south-southeast corner of the enclosure. You’ll notice some people out in the field (yes, this spot has been farmed for a long time—after all, it is a large, flat area). The field is littered with flint chips. It takes a moment for your eyes to adjust to what to look for, but once they do, it doesn’t take long to start finding them. Down in the far southeast corner, you might be able to see that there are corridors through the walls. But they are actually more than just walls: there is also geology going on here. You see, the top of the hill is resistant bedrock and a lot of the edge is an outcropping of this bedrock. The bedrock sure looked to me like the kind of Blackhand sandstone that I see all the time in Hocking Hills, but I don’t know (and was unable to verify) if it is actually Blackhand or just a similar, but different, layer of rock. In most places along the edge, the Native Americans enhanced the natural bedrock edge by piling rocks on top of it. Here’s a look as we went through the gap in the sandstone. As you can see on the map, this southeast corner has some of the more dramatic topography on the site. The corridors also lead to another, smaller earthen mound off the tip. It also looked as if, before it was disturbed by us moderns, these corridors or gaps had had rocks piled in them to block them. The site also has a bunch of really cool nature. At the end of this corridor was a huge beech tree I just had to take a picture of. 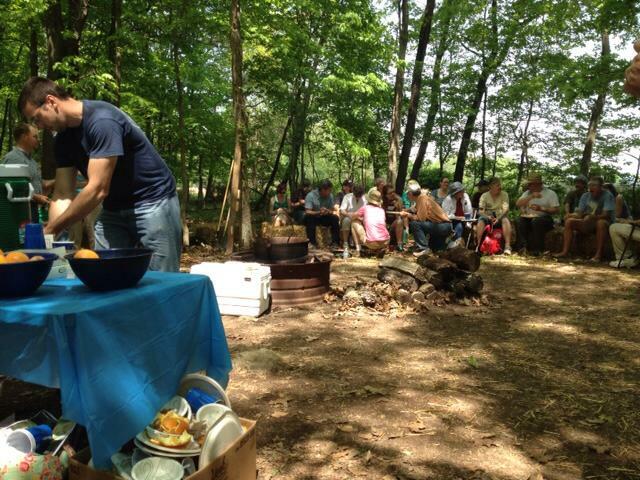 At lunchtime we all gathered for a great lunch, supplied by the Perry County Historical and Cultural Society. We also got to hear what the Heartland Earthworks Conservancy was doing to try to save Ohio’s mounds. There are so many of them, but most of them have been obliterated by farming or other activities. The Conservancy was formed to both map, if possible, acquire ownership of properties. 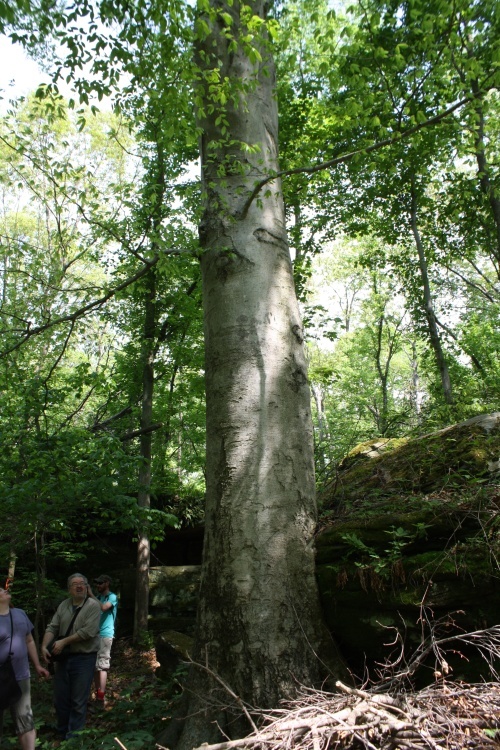 One of there most recent (and exciting) successes was saving the Junction Group near Chillicothe, which will be added to the mounds that the National Park Service manages in that area. Here’s another shot of us eating lunch. You can see me sitting off to the right . . . just look for the bare feet. After lunch we visited the central mound . . . well, it used to be a mound. On the other hand, the depression dug there created a small marsh, so it is now a wildlife location. Here’s a panoramic shot (covering about 120°) of the pond. You can see how all the stones now ring it. 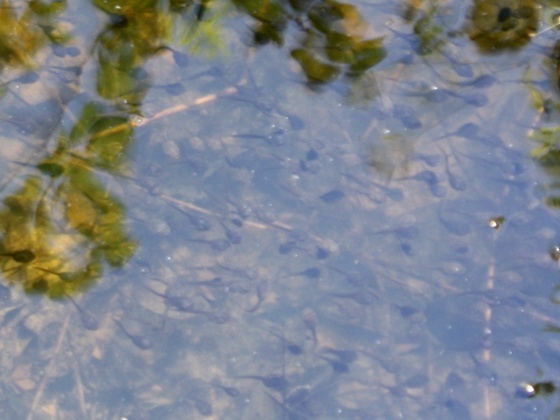 There was another little pool nearby with a mass of tadpoles in it. After the mound, we headed east for a closer look at the wall on that side. Here you can see what the rock wall looks like. The bedrock edge is less impressive here (though still present), so the Native piled up the stones to enhance it. 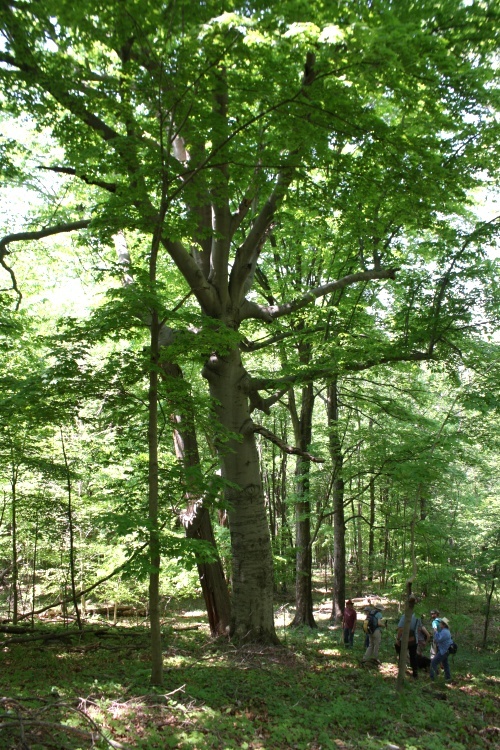 Finally, we headed back down the hill, and encountered yet another huge beech tree. Let me finish by stressing the good work that the Heartland Earthworks Conservancy does. It’s a non-profit with a board of impressive archaeologists, experts, and nature lovers. I was also impressed with how much they had learned about how to save these sorts of locations, teaming up with various other organizations in the state to leverage various monies that might be available. You might also consider giving them a donation. They are all volunteer, so all monies go to purchasing property to be preserved. Marcia, in the comments, researched this, which has allowed me to correct and enhance this the best I can. I’m not sure just how much I might have heard incorrectly, or misremembered, or even if the different tour guides were just passing along what they’d heard from others. 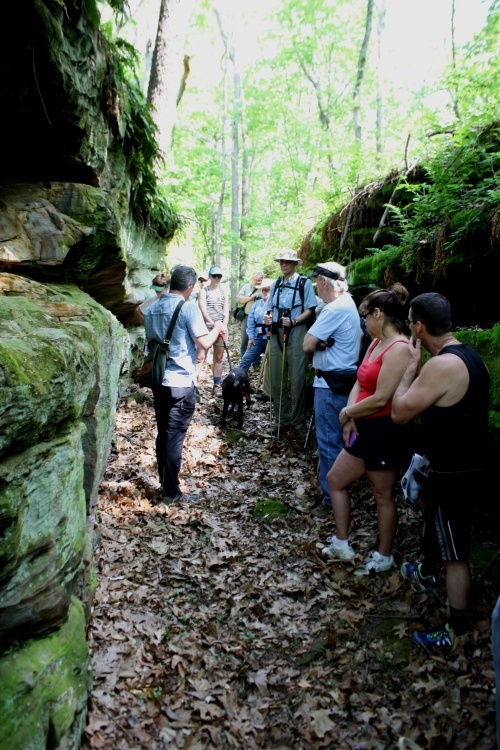 The Cooperrider family has owned the Glenford Fort site for a very long time, since 1831. 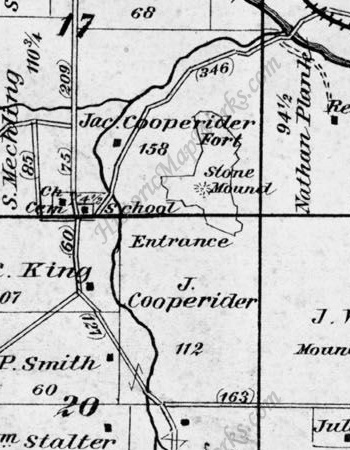 You can see their ownership in this portion of a map from 1875. You can see that they had land in both sections 17 and 20 in the township (named, not too surprisingly, Hopewell Township). The Perry County Soil and Conservation District (with the help of Heartland and the other conservation bodies) now owns at least some part of the portion in section 20 (I don’t know if they now have that whole piece, or just some part of it adjoining the existing Cooperrider property), so I’m guessing that the Cooperriders must have sold off that portion at some time. This is where we ate lunch, just off the portion of the property still owned by the Cooperriders. In 1987, James Dutcher, described as an “amateur archaeologist”, obtained permission from the owner, Elizabeth Cooperrider, to excavate the mound, which he did with a backhoe (those are heavy rocks). He retrieved a layer of charcoal which he had carbon dated. They came back with a date of 2220 +- 50 B.P., which would put them late-Adena or early-Hopewell. This information came from Glenford Stone ‘Fort’ and Other Stone Constructions in Ohio and Beyond, by Norman Muller, NEARA (New England Antiquities Research Association) Journal, 44 (1), p. 30-41. In addition, there is an article by Richard Moats, A Summary of Fort Glenford Hill Top Enclosure and Mound, Ohio Archaeologist 61, no. 1 (Winter 2011), 30-35. (Click on the PDF link on that page to access it.) In it, he says that Dutcher at some point stopped excavations, and then in early 1988 became ill and died. This may account for the mound never being restored. 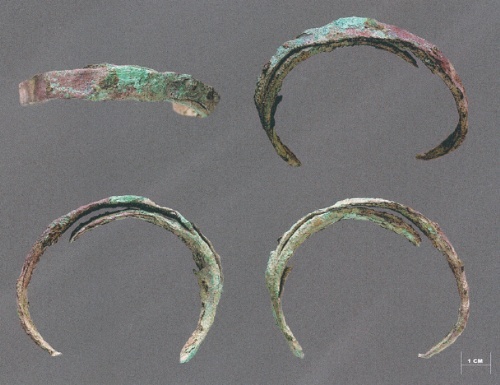 Here is a picture from the Moats paper of 4 copper bracelets that were recovered. That’s a great way to spend a day in May. It looks much like a fortification, and it’s hard to think of something other than a limited access area. If archeologists ever find out what it was, the solved mystery would certainly not diminish the attractiveness of the place. Many years ago, after seeing this site in the old Squire and Davis book Ancient Monuments of the Mississippi Valley, my friend Bob & I went there and asked the property owner if we could hike up and see it. I admired her spectacular iris garden, with many fancy specimens. She told us an archeologist had been working up there investigating the stone mound and had a trailer next to it that he stayed it, but he wasn’t there that day. We spotted quite a bit of flint chipping remains just laying on rock as we went up, and the stone mound was still there. It is possible I have some photos somewhere. It was conical and tall. When we came back down, the property owner gifted me with a paper bag with some roots of the iris’s I had admired. We got permission to hunt for arrowheads in a nearby field, and I found more in one day then all the years I had hunted. Many different colors of flint ridge, maybe due to being not far from there. I hope this site is preserved. I’d like to know who the “archeologist” was that was working on the site then. Perhaps they have records of it. The destruction of the stone mound either took place on their watch or later. Something is wrong with this narrative. There was NOT a bulldozer run thru the mound. The digger used a backhoe/excavator to pile up rocks, and the Perry County historical people supplied pumps to keep the water out that would not go thru the clay soil. The man is now deceased. Also, what is a “mud snake”? I live near by and have NEVER seen, or heard of, a “mud snake” in Ohio. Put some shoes on and get your story straight before making false assumptions. But I am interested in providing accurate information. And I also suppose that it might have been possible for you both to provide your own perspective and be polite about it at the same time. What do you think? I was relating what I was told on the tour. Maybe I misremembered the word “bulldozer” when what they were talking about was power equipment (i.e., backhoe). But the effect was the same, as you can see in the picture. Regarding the snake, “mud snake” is what I’ve always heard them called, but there all always all sorts of folk names for various things in nature (e.g., ground pine, ground cedar, running cedar, fan clubmoss, etc., for Diphasiastrum digitatum). Mud snake is just what I’ve heard for those small snakes that one finds in muddy water. To tell you the truth, I didn’t get much of a look at it—it’s head just popped above the surface for a brief moment when I was there. But others got a better look (and a picture). Maybe you’d like to help us out by identifying it? 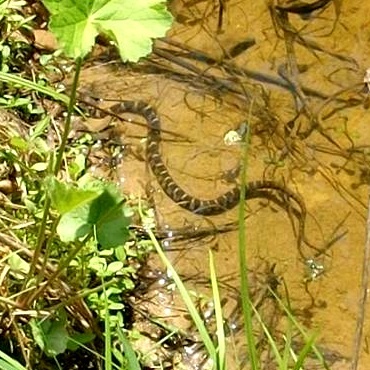 It seemed too small to be a northern watersnake. Maybe a Kirtland’s snake? I did a little research today and I was mistaken, we must have found Glenford Fort from the Cyrus Thomas’s map. I also found answers to a few of my questions above. And have more questions. Atwater’s 1820 map of Glenford Fort has notations that the stone mound was 220 feet in diameter and 22 feet high. In 1980, the mound was described as being 15 feet high and 100 feet wide, with stones having been removed over the years for construction. It says in this article “Glenford Stone Fort and Other Constructions in Ohio and Beyond”, by Norman Muller, that in June 1987, James Dutcher received permission from Elizabeth Cooperrider the owner (it had been in her family for 170 yrs) to excavate the stone mound in search of diagnostic material to date it. “He excavated a trench with a backhoe, 30 X 10 feet” and found 13 flat stones, four postmolds and a hearth and layer of charcoal. He sent it off and got a radiocarbon date of 270 B.C. So I am wondering what further destruction happened after that archeological investigation? Was no attempt made to put it back close to its original condition after it was excavated and the description of Mullers work incorrect? Or did someone destroy what remained after that? It would have been Elizabeth Cooperrider who gave me the iris roots, and it must have been in 1987. She was quite clear that it was a real archeologist on her property when I spoke to her. She was proud of her families preservation of the site.The mound was intact the day we hiked up. It was the central feature to be seen upon entering the enclosure.Perhaps with photos, Heartland can restore this important feature? Her iris’s are blooming this week in my yard. I found another article on the web, by Richard D. Moats USAF Ret., ASO 13900 St. Rt. 668 Glenford, OH 43739. It said Dutcher died before he could reconstruct the mound. It also has information of his findings. I saw on Brad Leper’s blog some comments questioning Dutcher’s qualifications as an archeologist. James Dutcher published findings in the Summer 1988 issue of Ohio Archeologist, and this article by Moats appeared in the Winter 2011 issue. In it Moats said Dutcher left out findings relating to burial or artifacts, generously hoping he was going to publish them later. Where are the objects that were found? His field notes were lost. The article by Moats can be found here: “A Summary of Fort Glenford Hilltop Enclosure and Mound. Many thanks for looking up all this! Fascinating, and I really appreciate all the extra information. You are wrong to identify the late James Dutcher as an archaeologist. He had no institutional affiliation, no academic training in archaeology, and no experience in scientific excavation techniques that might have qualified him to undertake the excavation of the Glenford Fort stone mound. He can be considered to have been an “archaeologist” only in the sense that I could be considered to be a “plumber” if, in spite of my lack of any training or experience, I attempted to fix a leaky pipe in my basement with a chain saw and a hammer. By the way, I found a PDF of the article by Moats, available here. It includes the pictures, including flint arrowheads, and copper bracelets. Moats also identifies Dutcher as an “amateur archaeologist”. Once again, I thank you for finding all this and bringing it to my attention. You are most welcome – I really love these sites. Thanks for the link with the photos of the artifacts! I wish I could have attended your hike to see it again. I wonder if the Archeological Conservancy could be contacted by people who care about the sites preservation/restoration? Perhaps they could partner with Heartland to do so. I know they partnered with Arc of Appalachia to preserve Spruce Hill in S. Ohio. They are a great organization. 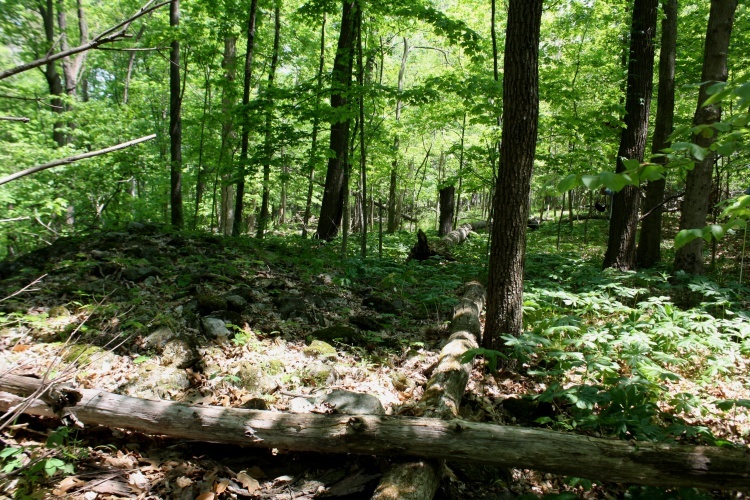 Spruce Hill was to be sold in parcels that could have been developed. I met the landowners there years ago the same way – following old maps to sites not public and talking with the land owners and exploring. I taught the landowners grandchildren how to find arrowheads, and was shown the collection his grandfather’s grandfather had surface hunted in the field below. Perhaps if Mrs. Cooperrider has regrets about the “archeology” that was done there, she would like to see the site preserved and restored and could be persuaded. Bob – Perhaps you left the site of the mound (now, “crater”) by a different side. My husband and I were in your hiking group, and we left with co-leader Bill (the archeologist – wasn’t that his name?) heading past the pond, where there was a folding table set up at the edge of the field to display some of the artifacts Dutcher found. Not a lot, and I don’t know whose custody they’re in currently, but there were some bags of points and chips, primarily, and may have been some other things, too. Ah, for better observational skills and memory! I did leave the mound from the same side as you did, I think. I saw the table and looked at it, but did not realize that the artifacts on the table were some of the ones that had been found in the mound by Dutcher. Our tour guides were Bill Dancey (an anthropologist) and Aaron Rourke. Well, we may be mistaken, but both my husband and I were under the impression that the items were from the mound. Can’t guarantee it, though. Hey, that makes perfect sense. I’m just embarrassed that I didn’t realize it myself. Bob, thanks for the great post. It strikes me as funny that these hilltop “fortifications,” of which there are probably hundreds stretching from Ohio at least to Georgia and possibly further at each end, continue to be regarded as “mysterious.” It’s rather obvious what these structures were, but don’t expect archaeologists to tell you. Why do you even ask that archaeologists do the interpretation? Archaeologists are lousy interpreters. That’s not what they are trained to do. Most archaeologists these days are technicians. These hilltops fortifications are exactly what they appear to be — fortifications. But because they mostly have internal moats and many gateways, and some are enormous, they were not built to protect humans. Only our myopic culture conceives of all forts as built for human defense. The prehistoric fortifications protected bird roosts, specifically roosts of the Passenger Pigeon, from natural predators, and all of their attributes were engineered to accomplish that task perfectly. These were, in essence, bird sanctuaries. And Glenford is one of the sites that makes that most obvious. It’s great that there is a radiocarbon date for Glenford. 2220 BP +/-50 is exactly what I’d expect. But I must correct that such a date would mark it as “Hopewell.” Aside from being a mythical classification (there was no such entity as a Hopewell people or culture), the early Woodland Period is long before the stylistic changes associated with what used to be called Hopewell by some. It is very clearly and squarely Adena, and anyone who tries to tell you different is pulling your leg.